China’s faltering ties with North Korea have spawned a disinformation campaign against its estranged ally, with the rift holding larger geopolitical implications. 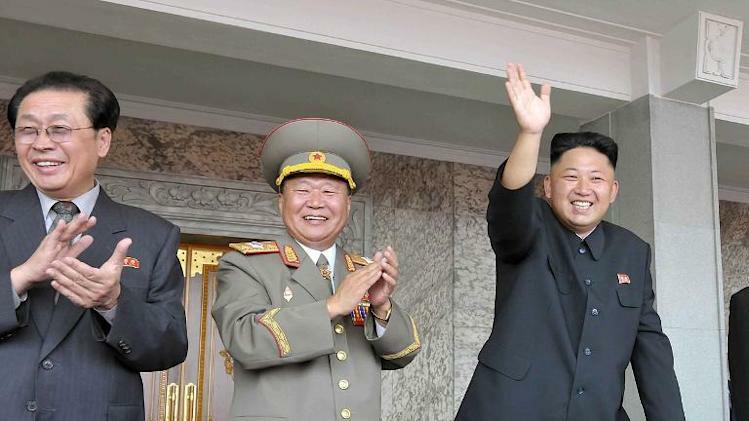 In happier times: Jang Song Thaek (left) with supreme leader Kim Jong Un. China’s autocrats, by upending the status quo in the East and South China Seas and the Himalayas, are waging an undeclared war against multiple neighboring countries at once. Their next target is likely to be fellow communist state North Korea, now an estranged ally and the last frontier of the Cold War. China’s “blood relations” with North Korea — acclaimed in the past to be as close as “lips and teeth” — have soured badly. A widening chasm between China’s assertive, nationalistic president, Xi Jinping, and North Korea’s defiant young dictator, Kim Jong Un, has thrown the bilateral relationship into a tailspin. The 30-year-old Kim, the world’s youngest head of state, appears determined to chart an independent course, spurring increasing unease in China. North Korea has become the target of a Chinese campaign of disinformation after it executed China’s most-valued friend in its power hierarchy, Jang Song Thaek, a four-star general who was Kim’s uncle by marriage. The Chinese campaign seeks to portray Kim as a wickedly eccentric and bloodthirsty megalomaniac. Jang, China’s main link to the Stalinist regime in Pyongyang, was convicted and executed Dec. 12 for treason, including plotting a coup and underselling national resources (such as coal, land and precious metals) to a “foreign country” — a reference to China. This has infuriated Xi and many others in China, with one general warning that North Korea was slipping out of the Chinese sphere of influence and government mouthpieces calling for a tough new approach. China’s online censors have conspicuously overlooked social media’s increasing vilification of Kim. According to a candid Jan.6 commentary in China’s Global Times, Jang’s fall signifies North Korea’s effort at “de-Sinification,” reflecting an “anxious desire to shake off its overdependence on China and find a way out of the deadlock with the U.S.” The article, authored by Da Zhigang, director of the Institute of Northeast Asian Studies, Heilongjiang Provincial Academy of Social Sciences, said the development represented a serious setback for China’s interests because it symbolizes the “acceleration” of the North’s attempt to “reorient” toward the U.S. as part of its juche ideology of self-reliance and the songun ideal of a militarily strong, secure state. Immediately after the execution, a small but sensationalist Hong Kong newspaper aligned with the Chinese Communist Party reported that Kim and other senior leaders watched as Jang and five associates were stripped naked, thrown into a cage, and devoured by 120 hungry dogs. The paper, Wen Wei Po, cited not a single source for its claim, which harked back to the ancient Roman tradition of throwing convicts to dogs, lions or other animals. Yet days later, the outlandish claim was published in the Straits Times, the main newspaper in Singapore, a city-state with no press freedom. The Dec. 24 Straits Times’ report was authored by a former Wen Wei Po reporter who was once jailed in China for allegedly spying for Taiwan. By Jan. 3, the speculative story had been picked up by media across the world. Swedish Foreign Minister Carl Bildt tweeted Jan. 3, “Well, the truly interesting thing is that the story seems to be put out by the authorities in Beijing.” The death-by-ravenous-dog tale from the country famous for its “dog meat festivals” was a reminder that China uses the Hong Kong-Singapore route for disinformation. Eating dog meat is an ancient custom in China. Indeed, in some regions there, eating dog meat on the summer solstice is believed to help ward off evil spirits and disease. Demonizing the reclusive and recalcitrant North Korea comes easily to many in the world, given its government’s opaque inner-workings and how little hard information flows out of that hermetic nation. Many outsiders are ready to believe any story about it, especially because there is no way to disprove it. The international media, in any event, loves stories about dictators, however poorly sourced and farfetched they may be. In this case, the North Korean regime itself lent a “dog” angle by publicly branding Jang as “worse than a dog.” Still, it is significant that the unverified execution-by-dog story was not lapped up by the media in South Korea, where journalists track developments in North Korea closely with access to intelligence sources and defectors. The story bore distinctly Chinese characteristics, including attention to precise numbers — 120 dogs, starved for five days, were supposedly unleashed in an action supervised by 300 officials. Numerical symbolism has always been important in China, extending even to witch hunts — for example, the “Let a Hundred Flowers Bloom” campaign in the 1950s. China’s warriors of disinformation betrayed an uncanny trait in counting both the number of hounds who ate up Jang and the number of officials who supervised the quan jue, or execution by dogs. The “120 dogs ate up Jang” story was a dead giveaway. In fact, the tale now is an acknowledged fabrication — one that apparently originated as satire on a Chinese microblogging website and was repackaged as hard news. The tale served the disinformers’ purpose in depicting Kim internationally as more brutal than previously believed. Evidence thus far points to Jang’s execution by North Korea’s normal practice — a firing squad. What is remarkable is that the doggy disinformation was widely disseminated by a country whose political system is no different than North Korea’s. China indeed has well-oiled, sophisticated repression and propaganda machines that, unlike North Korea’s, have kept pace with technological advances. In truth, China has learned some of its disinformation tricks from the United States, which has a penchant to demonize dictators it dumps after using them. China’s faltering ties with North Korea, however, make it stand out as a lonely rising power with no real allies, in stark contrast to the U.S., which boasts 27 military allies and a number of other strategic partners. There are no good options for Beijing on North Korea, especially after Jang’s execution and Kim’s purge of some other purportedly pro-China elements. Kim has presented himself as a tough leader who will not allow China to treat North Korea as a vassal state. Kim Il Sung, the founder of the state, paid 37 official visits to China, and his son and successor, Kim Jong Il, went nine times. But Kim Jong Un has not been to China even once since he came to power after the death of his father, Kim Jong Il, in December 2011. Thumbing his nose at Xi’s entreaties for restraint, he successfully fired a rocket to place a satellite in orbit in late 2012 and carried out his country’s third nuclear test in February 2013. His open defiance prompted China to endorse new United Nations Security Council sanctions against North Korea, further fraying the bilateral relationship. China’s policy dilemma is compounded by the fact that it has little interest in the collapse of the Kim family’s rule because that could unravel the North Korean state and create a reunified and resurgent Korea allied with the U.S.
China has territorial and resource disputes with North Korea that a reunified Korea will inherit. The territorial disputes center on Chonji, the crater lake on Mount Paektu — where the Sino-Korean boundary has not been settled — and certain islands in the Yalu and the Tumen, both border rivers. Whereas Washington’s policy on North Korea focuses narrowly on its denuclearization, Beijing seeks geopolitical influence and continued access to the vast reserves of iron ore, magnesite, copper and other minerals there. It also wants to block Russia and Japan from making strategic inroads into the North. It remains wedded to a strategy to prevent South Korea from absorbing the North. The Kim regime, for its part, seeks normalized relations with the U.S. so as to escape depending excessively on China. It thus chafes at the Obama administration’s use of Beijing as a diplomatic go-between. Make no mistake: The China-North Korea rift holds far-reaching implications for regional geopolitics. U.S.’s North Korean policy must reassess its dubious reliance on Beijing as an intermediary and find ways to reengage Pyongyang directly — an imperative that also extends to policymakers in Tokyo and Seoul. Brahma Chellaney is a geostrategist and the author, most recently, of “Water, Peace, and War” (Oxford University Press, 2014). (c) The Japan Times, January 8, 2014.